Short Term Trading forex trading links forex trading books market statistics trader values euro and us dollar Shocks Crashing EURUSD: Has the market bottomed? Europe: What is left to sell? During last week’s monetary policy for June, the ECB finally dropped the long-lasting reference to potentially lowering rates in the future. Instead, it expects to keep rates at current levels for some time. The economy has been continuously improving, albeit at a slow pace. The ECB changed its gross domestic product (GDP) forecasts for 2017 to 2%, to 1.8% for 2018 and to 1.7% for 2019. For the first time since 2011, economic risks are now considered more balanced. Inflation remains weak and this will delay the first rate increase after many years of cuts. In addition, while the job market has improved, the quality of the new jobs seems to be low. As a result, Mr. Draghi is asking for more patience. Quantitative easing stays in place for now, and all decisions are postponed to September’s meeting (and maybe after that). What is left to sell? Key European political elections have been completed, and, for the next four or five years, continental Europe has elected parties that are pro Union. Will they succeed in keeping the European Union (EU) together? Only time will tell. Self-preservation could come into play since the next decade will be crucial for the survival of the European Community. The decision to pursue the so-called “two-speed Europe” goes in the direction of a more meaningful and balanced common market. While Europe is gaining traction, the US is being dragged into a political impasse. The high level of animosity between various parts of the political arena, the media and the public could weigh on consumer confidence during the long run. In May, excluding food and energy, retail sales declined 0.30% compared to the expected increase of 0.20%. Discretionary spending was also hit, and, for the second month, sales at food and beverage locations fell to 2.3% from 3.0% annually. Good news are discounted in current prices. Reforms are on the backburner for now. Therefore, what is left to buy? The Federal Reserve has increased rates by 0.25% in June, and it is expected to tighten more in coming meetings. The Fed anticipates the job market to improve further in the second half of 2017. Wages are under the lens, and the Fed considers the decline of inflation as temporary. Finally, the Fed outlined a plan for normalizing the balance sheet created during the three rounds of quantitative easing. Mrs. Yellen remained vague on when it will start the process since economic growth could change for the better or for the worse. Inflation is the major concern since the decline of prices might not be temporary and might be related to demand’s contraction. 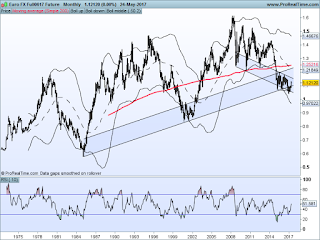 EUR/USD: Has a new bull cycle started? After years of decline, the euro has bounced off a key support line at 1.04. Considering the divergence between price and the Relative Strength Index (RSI) indicator on the weekly chart, the next target is 1.15. A move above that level could support prices to 1.18/1.28. 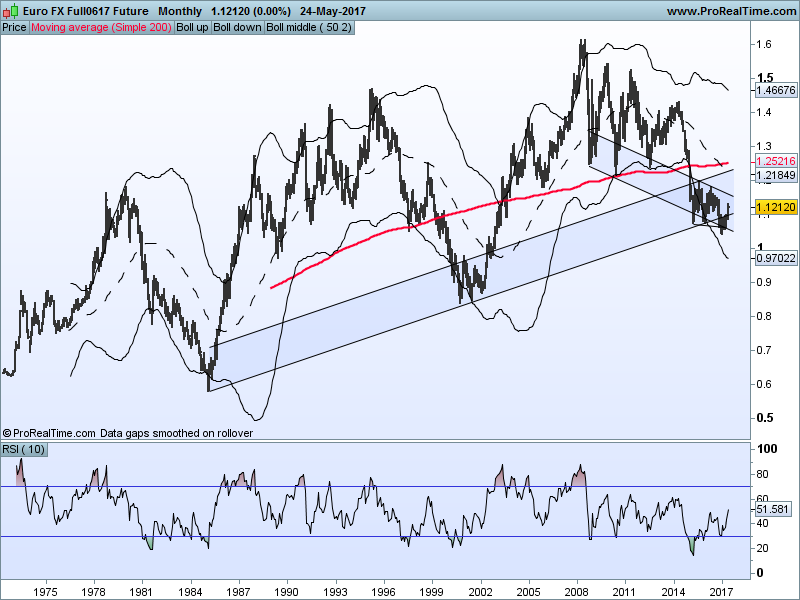 Since 1974, the EUR/USD (DMUSD) has tended to bottom every 15 years: 1995, 2000, and 2016 (?). Declines have lasted for 5–6 years (1980–1985, 1995–2000 and 2011–2016) before reversing. Downtrends have extended for about 40%–50% top to bottom (1.17–0.58, 1.47–0.84 and 1.52–1.04).